AIRBENCH reports it has delivered a large VertEx booth to a major customer in France and says the customer will be installing its own mixing equipment within the booth area. The system is designed to capture dust from the whole contained area, with various operations taking place within the booth. The company says the booth is based on VA181224 modules, each of which runs on high efficiency EC fans allowing the unit to run on ultra-low power, while moving tens of thousands of cubic metres per hour at full power. VertEx booths are modular and can be completely reconfigured at short notice; each VertEx base unit can be rebuilt to, for example, relocate the extracted face or rebuild into smaller or larger booth systems. AIRBENCH has announced the release of its new modular booth designed for attachment to the VertEx cross-draught system. The company says using the new modular booth construction, a full environmental containment booth can be built rapidly from standard parts. A market-leading power distribution system for enclosures has just extended its range. 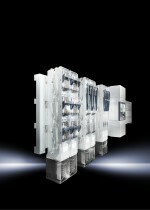 RITTAL says its popular 185mm Ri4Power busbar provides trusted, safe and compact power distribution within enclosures. CURTIS INSTRUMENTS says choosing the right charger is critical for maintaining a healthy battery and a fully operational forklift and it is important the battery has enough charge at the start of each shift. ZUMTOBEL says its new IP66 rated AMPHIBIA moisture-proof luminaire breaks new ground in lighting for even the most demanding applications. The company says its ‘one-material’ concept ensures optimum protection against physical impacts, chemicals and sudden changes in temperature while advanced lighting technology creates a safe and productive working environment and both the luminaire housing and the diffuser are made from the same high-quality material, composed of Polycarbonate, PMMA or CHEMO, ensuring optimum resistance over the full lifetime of the solution.